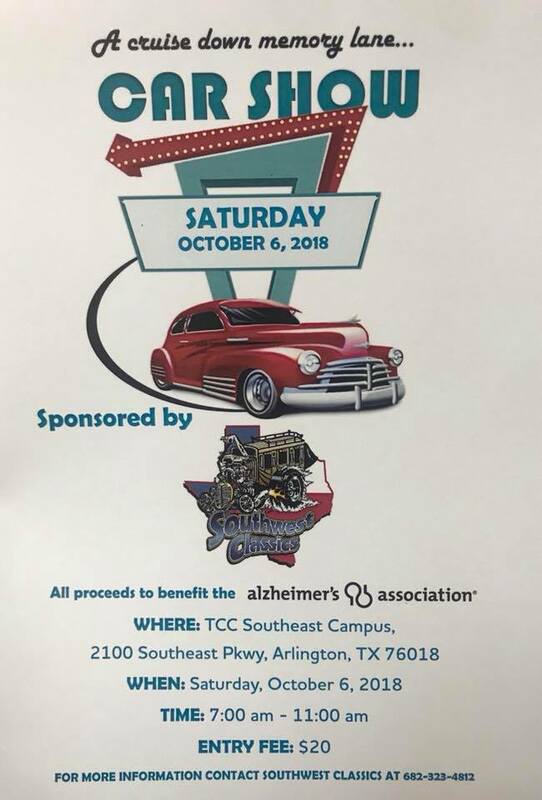 Southwest Classics is happy to pair up with the Alzheimer’s Association for A Cruise Down Memory Lane Car and Truck show! All Classics are welcome pre-1987! Bring the family out for a great morning of fun and a chance to check out some of the nicest classic cars and trucks in Texas! Drop off the kiddos at the Kids Place area for face painting and games and make your way around the rides! There will be trophies, raffles, music and fun for everyone! For all you ladies and gents not close to the shop to pick up your registration form, We can email you or send you a registration form in the regular mail! Just message us your email address, regular address! Registration is also open on the day of the show! The fee is $20 with all proceeds given back to the Alzheimer’s Association is North Texas. Nothing is better than an awesome day of fun with a great cause!